Sometime getting further away from the action during the wedding ceremony can yield a whole new perspective on the event. In this photo, I completely exited the building as if we are looking in like a passerby. The couple are small, but you can clearly see the ceremony is in full swing. I think this creative approach of always looking for different angles helps me be a better photographer. The country club was nice enough to let us use some golf carts to zip down to Long's Pond during Golden Hour for some bridal portraits with the water and Rockies in the background. The light was exquisite. Their reception venue has a deck with great views as well. 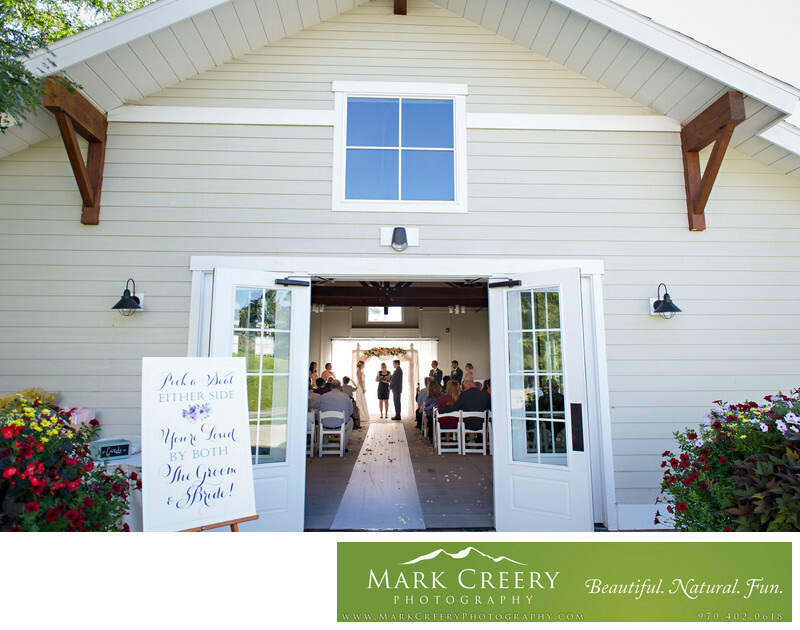 The venue has a full time wedding coordinator to help you with all your planning needs. Fort Collins Country Club is located in Fort Collins, Colorado. Contact: Alix Bold, (970) 482-1336. Location: 1920 Country Club Road, Fort Collins, CO 80524.